Library Home / Hours & Locations / Rare Books and Special Collections / 2019 / February / 06 / Vive la révolution! As part of the course, FREN 520: La Révolution française: histoire, fiction, débats, and in conjunction with the talk by Prof. Keith Baker (Stanford University) on Jean-Paul Marat, Rare Books and Special Collections is pleased to host a display of materials from UBC Library’s French Revolution Collection. The display, curated by students Juliette Christie and Marilyse Turgeon-Solis and Dr. Joël Castonguay-Bélanger (Department of French, Hispanic & Italian Studies), explores the start of the French Revolution in 1789, the political power of the printing press, the Revolution as portrayed on the stage and in music of the time, and the final days of King Louis XVI. A catalogue of the exhibition is available for download. 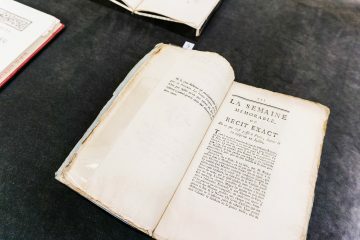 The core of UBC Library’s French Revolution Collection, a small group of 111 pamphlets, was acquired in the 1970s, but a recent collaborative acquisition effort between the Library and the Department of French, Hispanic & Italian Studies will allow the collection to grow substantially over the next five years. 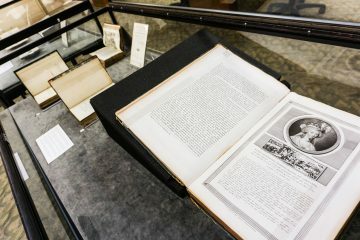 The display of materials from the French Revolution will be on in the Rare Books and Special Collections reading room through February 28, 2019. The RBSC reading room is open Monday through Friday from 10 a.m. to 4 p.m. For more information, please contact Rare Books and Special Collections at (604) 822-2521 or rare.books@ubc.ca.